Founder David Ruck says the use of this colonial imagery to represent the party was just intended to provoke discussion on why we don’t still own India. A popular Facebook page called The Pakeha Party is making waves throughout the country after it exploded onto the national scene yesterday, and its founders are now saying they intend to register with the Electoral Commission so they can fight to alleviate the unique struggles of white New Zealanders, such as finding a suitable variety of fair trade coffees and being able to afford DVD box sets of The Wire. Founder and spokesperson for the party, David Ruck, explained the rationale for his page on TVNZ’s Seven Sharp last night. Ruck dismissed the idea that Maori are economically disadvantaged because of the systemic marginalization of their parents and ancestors. That answer set off a frenzied reaction on the party’s Facebook page, with commenters agreeing that he made a “good argument,” and that their ancestors had also died or tripped and fallen at some point. Ruck added that he found the Maori notion of collective, community ownership of assets to be “disgusting,” saying they should not be receiving so much of “our” stuff. 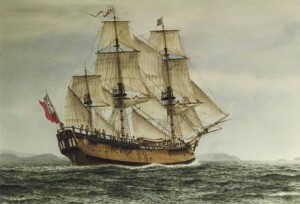 Despite its popularity, The Pakeha Party has come under fire from some for profiling itself with a picture of a British colonial vessel; something critics say makes the page appear intimidating, and suggests that the party condones white imperialism and expansionism. But Ruck said he wasn’t necessarily advocating a return to our British colonial past, though he was concerned about why we didn’t still own some of our former colonies. During a RadioLive interview with a noticeably stoned Duncan Garner, Ruck conceded that he wasn’t “schooled up” on Maori history, either. When asked about what his policies would be, Ruck said that the party wasn’t yet sure about those details, but would aim to return white people to surplus by the financial year of 2017/18.